Despite Israel's 'gesture' letting 500 Gazans pray on holy site - where Jews forbidden to pray - Hamas calls for Muslim violence. Apparently Israel's "gesture" to allow 500 Gazans to pray on the Temple Mount on the Eid al-Adha "sacrifice of Ishmael" - which fell on Yom Kippur and Shabbat - wasn't enough to appease the terrorist group Hamas. Hamas on Thursday threatened to attack Israel on the Temple Mount, the holiest site in Judaism, this Friday during the Muslim day of rest. "We will fight till the last drop of blood," Hamas declared in its call for Muslims to gather at the Al-Aqsa Mosque and "defend it." That call comes shortly after Jerusalem district police decided Thursday to limit entry on Friday to Muslim visitors, allowing only men over 50-years-old out of fear of renewed riots and violence. Police added that forces will be spread out in the eastern parts of the city and the Old City from the morning to prevent rioting. The latest round comes after Muslim rioters hurled rocks and fireworks at police on Wednesday ahead of the first day of Sukkot, wounding at least four officers. Jordan, whose Waqf (Islamic trust) maintains de facto control over the site and forbids Jews to pray there, condemned Israel for arresting the attacking rioters. Arab rioters likewise attacked before Rosh Hashana (the Jewish New Year), and have recently been stepping up their violence on the holiest site in Judaism as part of a general "silent intifada" that has been hitting Jerusalem hard. As for Hamas's threats to act on the Temple Mount, their influence on the site has already been revealed. 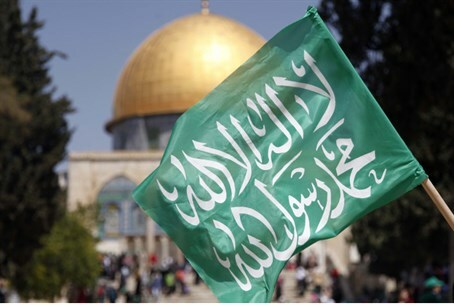 Toameh stated that Islamist groups in Israel launder Hamas cash and "donate" it to young Muslims to "study Islam" on the Temple Mount - in fact, they were earning between 4,000 and 5,000 shekels a month to throw rocks when Jews visit the site so as to block Jewish access.